There’s a common misconception related to the fruit and vegetable industry that may be limiting the quality of nutrition you’re receiving. The old adage “Eat your fruits and vegetables!” is something you’ve likely heard or even said yourself, and rightly so, for fruits and vegetables provide immense health benefits. Current dietary guidelines published by the USDA recommend that adults eat anywhere from 5 to 13 servings of fruits and vegetables per day, depending on the caloric intake and individual needs, to maintain an optimal weight and overall health. The USDA also recommends increasing variety among fruits and vegetables. But even if you follow the recommendations, there’s a common misconception related to the fruit and vegetable industry that may be limiting the quality of nutrition you’re receiving. This misconception is that fresh produce is better than frozen produce. So what’s the difference between fresh vs frozen foods? The truth is, frozen fruits and vegetables are packed with nutritional value, in some instances, even greater than that of fresh produce. What many people don’t realize is that often, the fruits and vegetables in the grocery store were most likely picked before they peaked in ripeness. This is done to ensure products experience minimal damage when shipped. While this approach may keep fruit looking good and fresh upon arrival, in actuality, it is not as nutrient-rich as it would have been if picked at a later date. With frozen produce, however, fruits and vegetables are picked at their peak, quickly sterilized in boiling water (a process called blanching) to kill food-degrading enzymes, and then immediately frozen to preserve a nutrient-rich state. While the blanching or cooking process does cause certain water-soluble vitamins, such as vitamins B and C to diminish, the overall nutrition is retained and subsequently locked in when frozen. These losses are minimal considering that the nutritional content of fresh produce can plummet significantly within days, while frozen produce can be kept and used over a long period of time with very little decrease in nutritional value. But it’s not only the nutritional content of fruits and vegetables that suffers when picked too early. Harold McGee made clear in his book “On Food & Cooking” that in some cases, taste is also affected. Many fruits and vegetables never reach their optimal point for taste once they are harvested. If picked too early, fruits like pineapple, melon, most citrus, and most berries will not continue to ripen or reach an optimal quality and sweetness. There is also a practical reason to consider frozen fruits and vegetables over fresh, and that is convenience. When purchased frozen, someone else has already done the work of washing, peeling, cutting and if necessary, removing pits and seeds. What you buy is typically 100% usable produce, saving you time and money, plus there are no surprises with spoiled or damaged product under the skin. The assertion that frozen produce is often better than the items that grocery stores promote as “fresh” is not an overstatement. To learn more about frozen food facts, visit the Frozen Food Foundation. 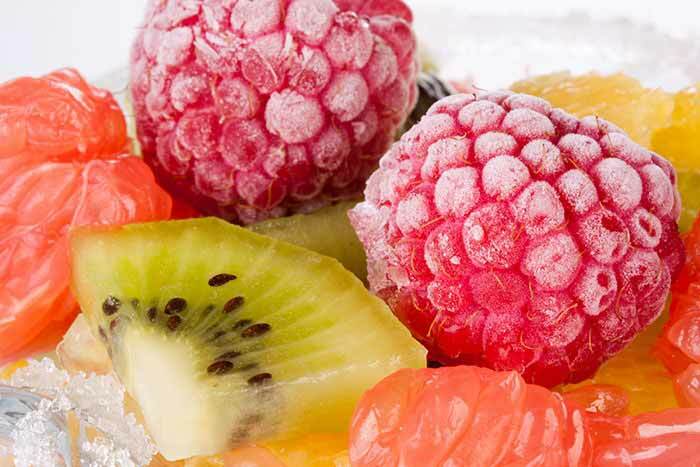 For a list of fresh frozen tropical fruits available at MIC Food visit our website www.micfood.com. We offer Latin-Caribbean flavors including frozen tropical fruits, chunks and concentrates, as well as other frozen options to add variety and taste to any menu. Or Ask Our Chef how you can incorporate tropical foods into your menu!